Creepy Ghost Stories - Real Stories of the Paranormal | Haunted Hollywood Hotels. Some of the world's finest stars stayed here and some even remain, long after there death. The Hollywood Roosevelt, Los Angeles. This is the place to stay if you want to rub arms with the rich and famous in one of the most hip and upbeat of hotels that Los Angeles have to offer. 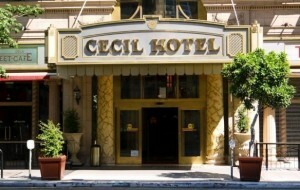 Situated right on Hollywood Boulevard, alongside the famous walk of fame and opposite the TLC Chinese theater. This impressive chic, boutique has been around since 1927 and has been host to some of the world's most loved icons from Marilyn Monroe, Charlie Chaplin, Shirley Temple, Clark Gable and Carole Lombard just to name a few, and now a celebrity hang out for more recent celebs from the likes of Eva Longoria, Jake Gyllenhaal, Kirsten Dunst and even Bruce Willis, who all like to let their hair down in the poolside Tropicana bar. So when you're sipping on your Cosmopolitan and and peeking over your shoulder for a glimpse of an A star celebrity, just be prepared to see some old of Hollywood's old dead favourites. 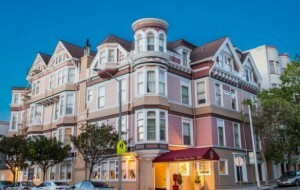 The ghost of Marilyn Monroe has been reported on many occasions by the staff and guests at the hotel. It’s reported that her ghostly reflection is seen looking back at you from a full length mirror that hangs in the Hotel’s lobby. 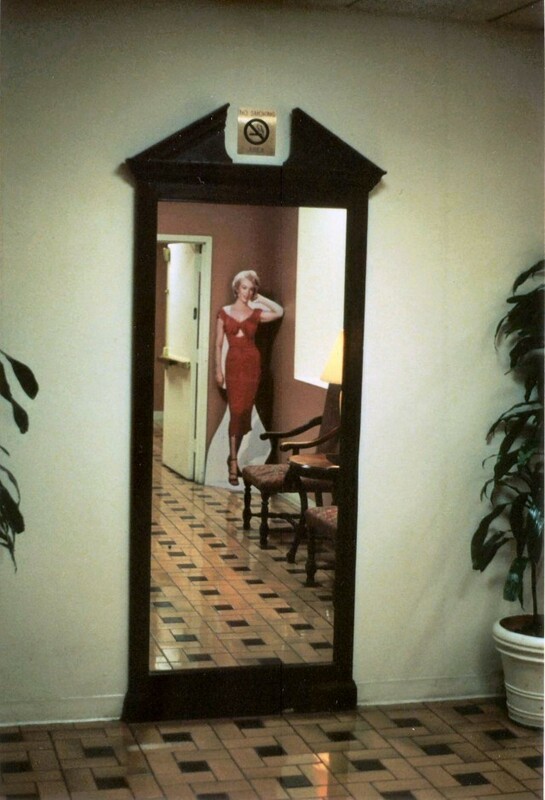 This mirror once hanged in suite #1200, the very suite that Marilyn once occupied. Her apparition has also been reported to be seen dancing in the Blossom Ballroom. But it’s not just Marilyn’s spirit that likes to hang out in the ballroom. An unknown ghost of a man is also seen here, dressed all in white who likes to play the piano and when he's approached he simply vanishes before your very eyes. Cold eerie sensations and temperature drops are often also felt in the ballroom. 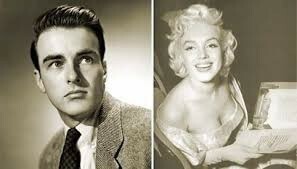 Montgomery Clift is another one of the Roosevelt's A listers who haunts this hotel. In particular room #928. Whilst he was making the film From here to eternity, Montgomery lived here for the duration he was making the film and he liked to chill out with his trumpet. His trumpet is still heard playing to this day by the staff and many of the guests. One guest who stayed in this room reported that when reading her book at night she felt a tapping on her shoulder, thinking it was her husband, she turned around to find him facing the other way and fast asleep. His ghost is also seen pacing the hall on the 9th floor as he is seen going over his lines for his movie. The ghost of Carole Lombard the wife of Clark Gable, is reported to be seen here often, just aimlessly wandering up on the 12th floor. 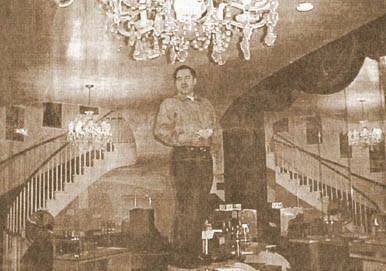 "Photo of orbs in the Roosevelt Hotel"
It's reported that former tv presenter Ana Gasteyer stayed in one of the hotels suites and reported that she was woken at night by the cries of a baby in he suite, she then saw a ghost of a maid in the closet in the hall, and witnessed a piano playing all by itself. 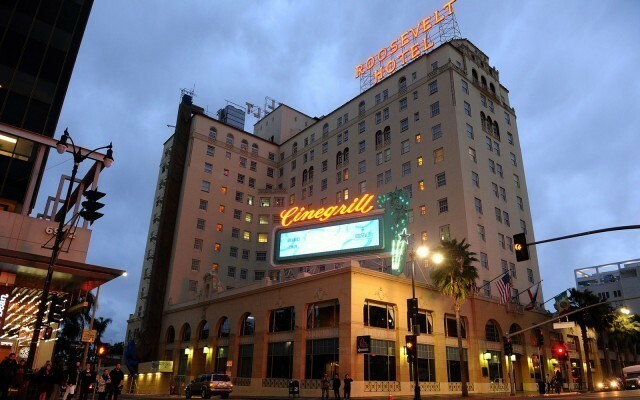 Even the security guards lay witness to the haunting at the Roosevelt hotel. They claim that on one of the security monitor they saw “someone” in the hotel’s pool, when they went to check it out, no one was there, but the figure still remained to be seen on the camera. In the main lobby of the hotel there is a little girl ghost with pony tails who they name Caroline, she likes to skip around the fountain singing. Often when guests go back to there rooms, they can’t get in as there doors have been locked .... from the inside. 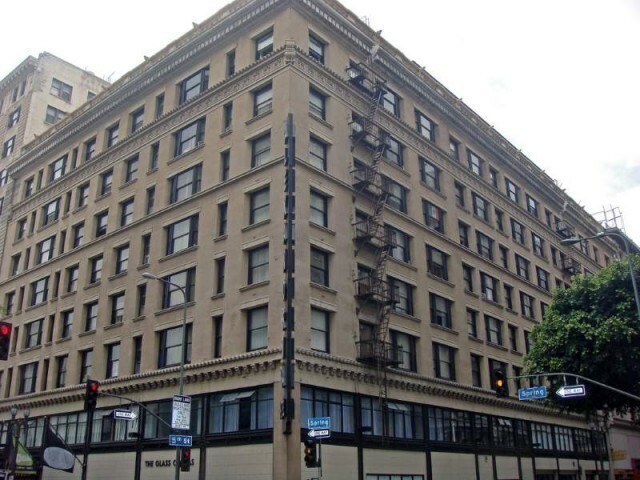 If you go Ivar Avenue, Los Angeles, you will see this old big building that is now home to many retired people who occupy one of the many appartements. But the “Knickerbocker Hotel” sign still remains big and bold upon the building, as does the grand old chandelier that hangs elegantly in the lobby, but that’s not all that remains within these old walls. 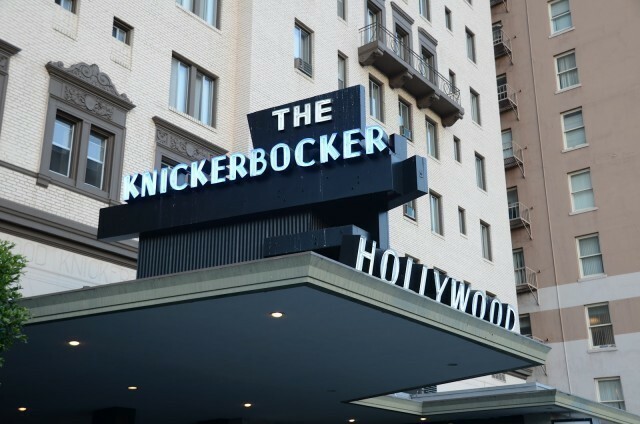 The Knickerbocker was once a hotel where, like the rest of Hollywood's hotels, would house and host the rich and famous. 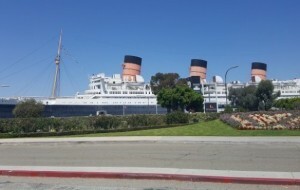 Elvis Presley stayed here along with the likes of funny duo Laurel and Hardy, Jo DiMaggio and Marilyn Monroe. 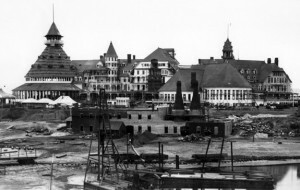 But the hotel’s name became tarnished and got a bad reputation over the years, as many of the guests who stayed here ended up dead. Director D.W Griffith died of a stroke in the lobby of the hotel and actor William Frawley suddenly and unexpectedly dropped to his death from a heart attack just outside the hotel on the sidewalk. Guests dragged his lifeless body inside the hotel in an attempt to save his life but to no avail. Then we have the suicide of a top costume designer Irene Gibbons. After she has slit her wrists in one of the hotel suites, she then threw herself out of the window just to seal the deal. 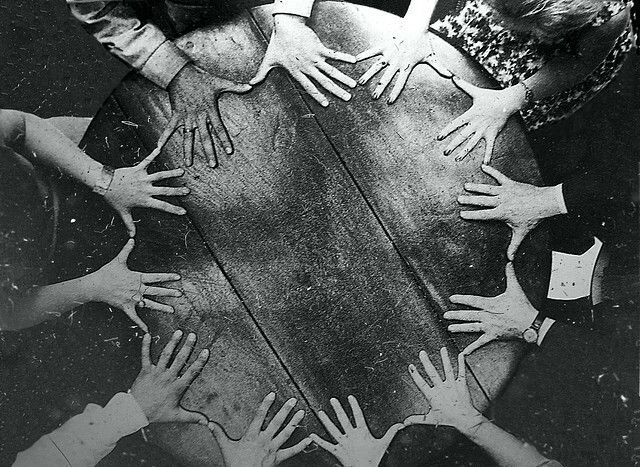 Bess, the wife of Harry Houdini who died on the night of Halloween back in 1926, did a seance with a group of friends on the 10th anniversary of his death up on the roof of the Knickerbocker. There was a freak storm that night, that only occurred over the hotel itself, some believe this was Houdini making himself known. It’s reported that the bar was the main hot spot for all these lost souls and it is that haunted that they closed the bar down and boarded it up where it remained untouched for 25 years. It was revived in the 90’s and turned into “The all-star theater and cafe & Speakeasy” with the original chandelier and even a Ouija board in remembrance of Houdini, it didn’t take long for the spirits to also revive themselves. Marilyn Monroe likes to mooch about from hotel to hotel it seems as she was often reported to be seen here in the ladies restroom on many occasions, along with the ghost of Valentino. Other reports of ghostly apparitions were reported to be seen to aimlessly just roam around the bar. Maybe the living didn’t like sharing their space with the Hollywood dead stars, as the bar is once more boarded up and un touched. 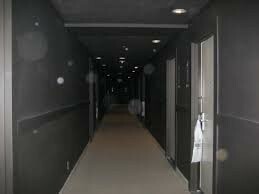 If you’ve ever seen the film se7en the you would of noticed that really eerie hotel. Well Ta Da.. that’s the Alexandria Hotel in all its creepy glory. 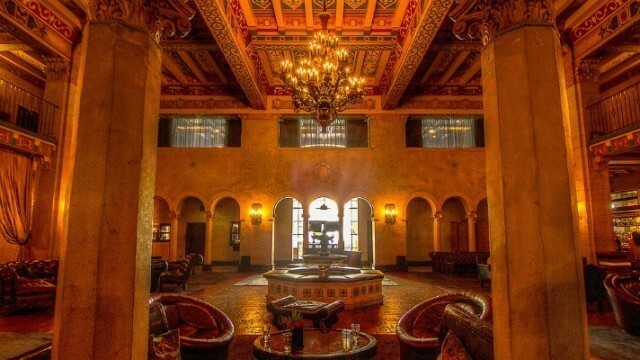 This historic building was opened in 1906 and was most luxurious hotel in downtown Los Angeles and everyone wanted to stay here including presidents “William Howard Taft” “Theodore Roosevelt” and “Woodrow Wilson” and A list celebs, Charlie Chaplin, Mary Pickford, Rudolph Valentino. Even King Edward VIII and Winston Churchill liked to stay here. But over the years the hotel fell into disrepair and was converted into apartment blocks in the 2000’s. The stunning ballrooms were also restored back to their former glory, but within these old walls also lays some old lost spirits which seem to like the new internal buildings. 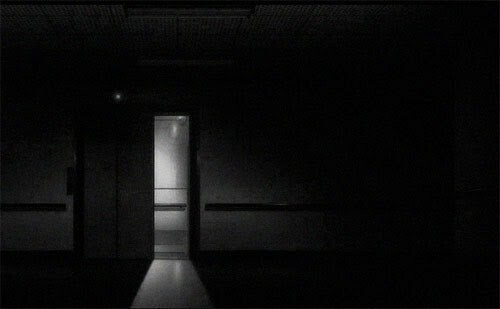 Many of the residence have reports of weird and paranormal goings on, from the elevator doors opening at random on different floors as if someone is getting on/off, then the doors closing and moving on to another level. Many people report of having a really uneasy feeling like someone is with you or watching you. On the second floor. 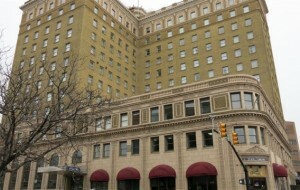 once the Grand Ballroom many people have reported to of seen “see through” apparitions dancing the night away. 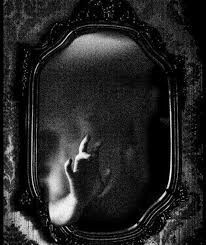 A shy teenage girl is seen to roam about the building and a lady ghost is seen looking at you from the mirrors. An angry ghost is reported to haunt Charlie Chaplin's old suite up on the 11th floor. Above on the 12th floor as you walk the corridors, cold spots and an eerie feeling is felt around and outside Rudolph Valentino's old suite. Another ghostly apparition who often seen around is a mysterious misty figure of a lady who walks these quite corridors, often at night.